This 13" Ceramic Platter will be hand painted just for you. I personally hand paint each and every platTeR with quality ceramic paints, and then I glaze and fire them in my kilns to create a quality keepsake. I do not use decals or paint pens, only quality non-toxic ceramic paints and glazes. Select up to 12 people/pets to add to the plate. 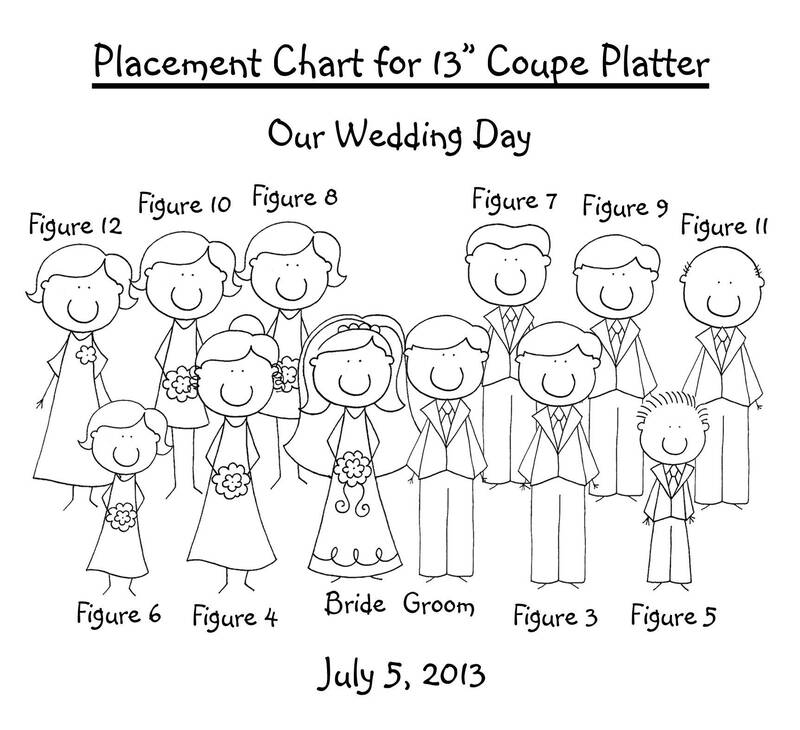 You will be using the designs shown in the picture gallery to select the details for each person (Sorry, I do not work from photos of your wedding or from descriptions). 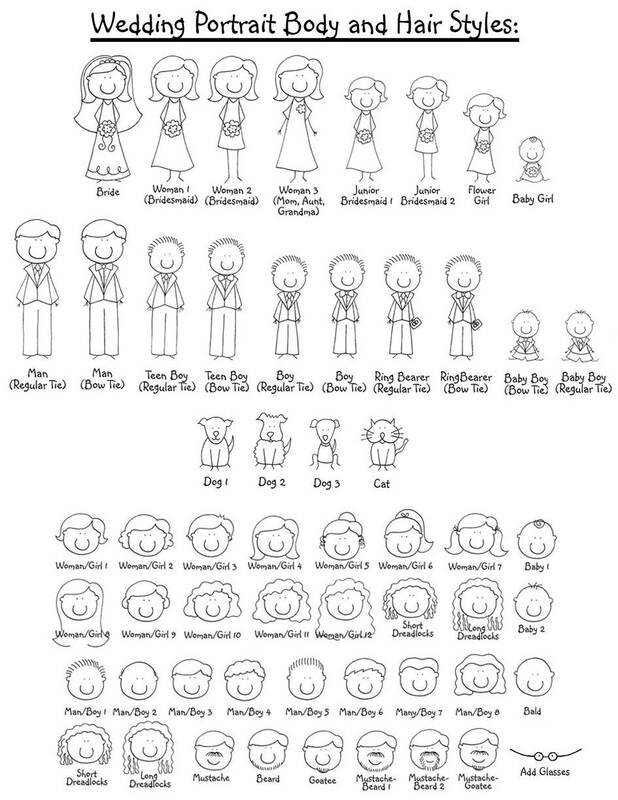 You will select for each person using the charts provided... 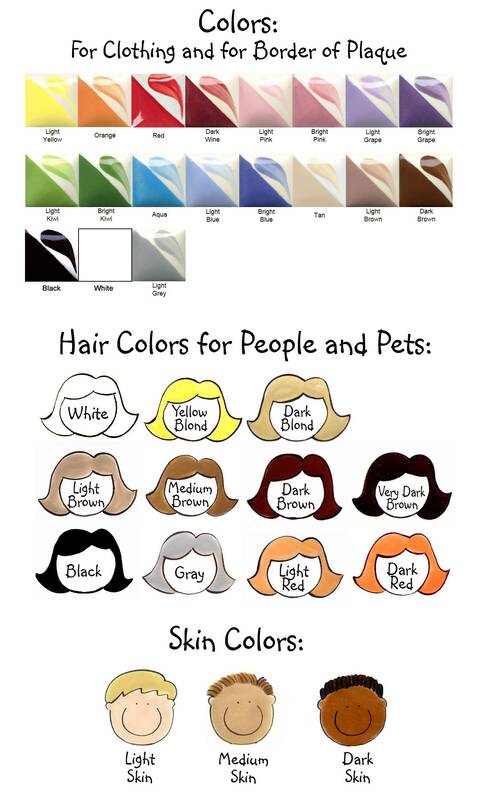 Hair styles, hair colors, skin colors, clothing styles, and clothing colors (An order form will be provided to you after purchase to make it easier for you to submit the details to me). 13" ceramic platter - Price Includes Shipping. You can preview the design options I have available in the picture gallery, and once you place your order, I will be emailing you an order form, for you to use to submit to me the details for your plate. Fill in the order form and email it back to me. 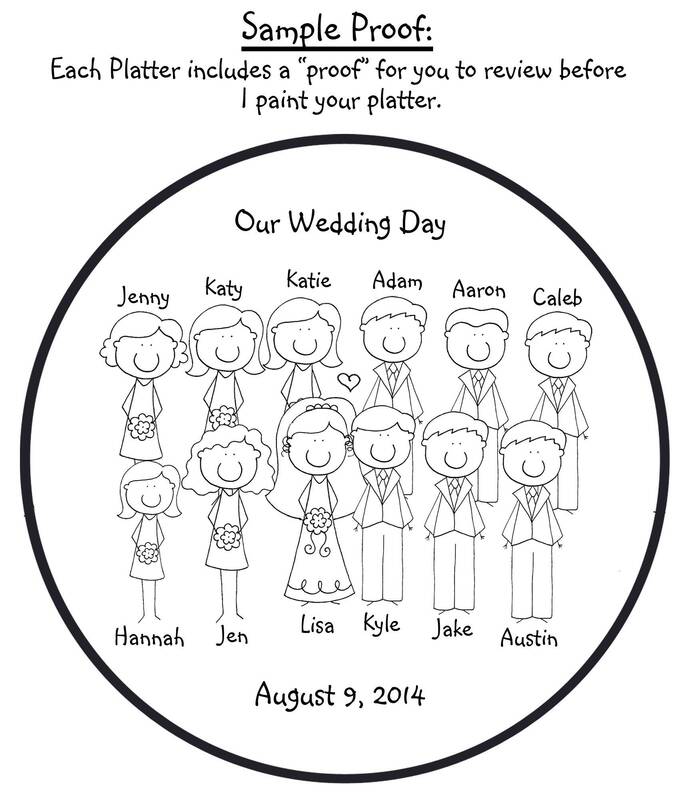 Once I have your order form with the details for the plate, I will create a black and white design (proof) for you with your selections so you can review the design before I paint the plate for you. (see sample proof in gallery). *YOU WILL NEED TO PROVIDE ME WITH AN EMAIL ADDRESS SO I CAN SEND THE ORDER FORM TO YOU. PLEASE ENTER EMAIL ADDRESS IN THE "NOTE TO SELLER" BOX IN THE SHOPPING CART WHEN YOU CHECK OUT. If you would like to look at the order form prior to placing the order, please contact me and I will be happy to email it to you. *Production time starts when you have submitted your order form with the details for your order. 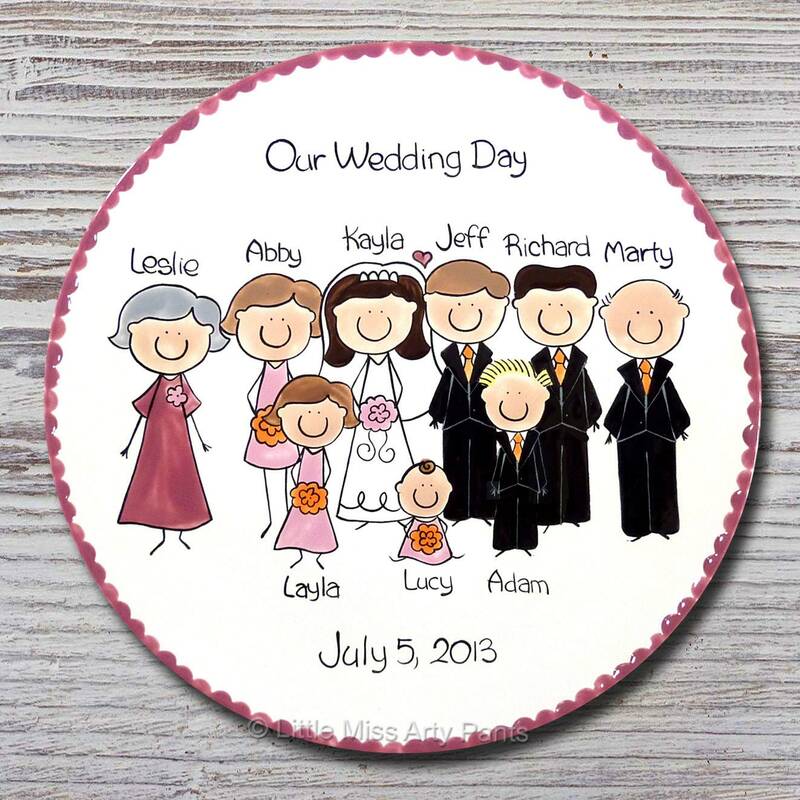 The people/pets designs in the picture gallery are all included in the price of the plate. Any variations you would like, different hairstyle, body styles, etc... are available for customization but please contact me PRIOR to placing an order as additional fee's may apply.